This recipe comes from my wonderful sister, Leah. It’s bursting with flavor and this method of cooking the chicken breasts (starting on the stove and finishing in the oven) makes them totally tender and juicy. In fact, I commented last night, “This chicken tastes like it’s from Boston Market, but without any of the grease.” By the way, it’s called Monday Night Chicken, but you can make it any day of the week. Set the oven to 425. Heat an oven-safe pan on medium heat on the stove. Add about 1-2 Tbsp olive oil plus 1 Tbsp butter. While that’s heating, take two bone-in, skin-on chicken breasts and season with salt, pepper, paprika, and garlic powder. Once the butter is melted place the chicken in the pan, skin side down, and cook for about 5 minutes. Flip and cook on the other side 5 minutes more. Finally, place the pan in the oven and cook 15-20 minutes. Set the oven to 450. Rinse kale, remove tough stems with a knife, and tear leaves into bite-sized pieces. Place on rimmed baking sheet. 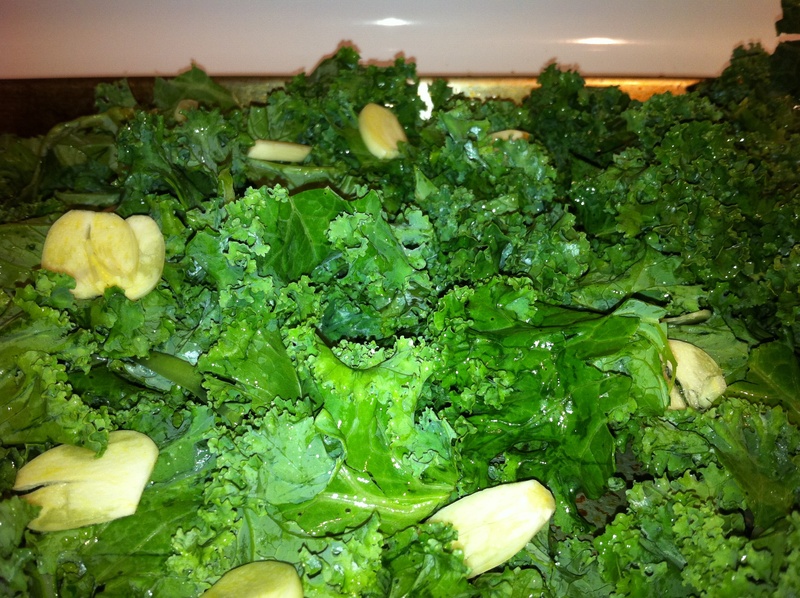 Thinly slice 4-5 garlic cloves and sprinkle on top of kale. Drizzle kale and garlic with olive oil (about 1 Tbsp) and season with salt and pepper. Place in oven and cook for about 10 minutes. 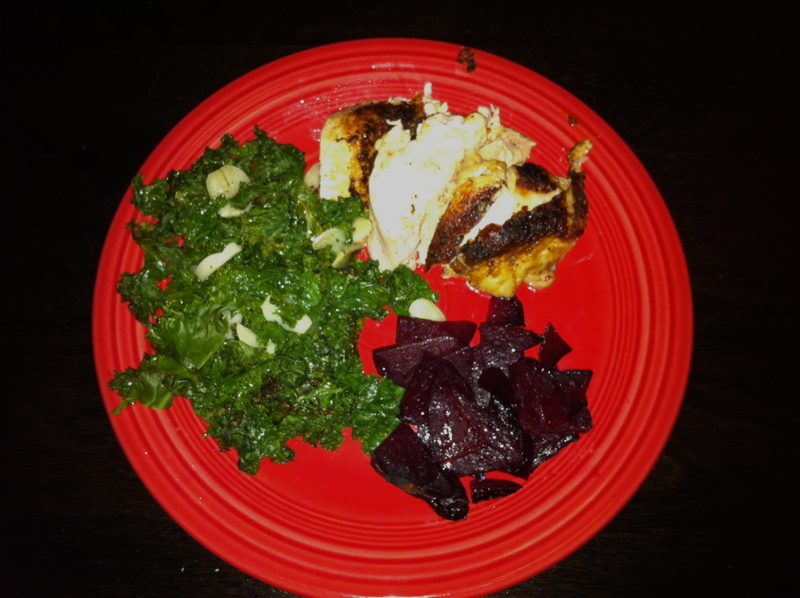 This entry was posted in Chicken, Vegetables on September 14, 2011 by Paige Greenfield.